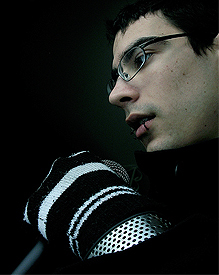 Aliceffekt is a musician, digital artist and designer from Montreal Canada. A man who’s artistic versatility has helped to create unique personal and professional projects. Alice has already produced a wide collection of tracks going from idm to darkwave, from industrial to glitch. He’s also collaborated with many other artists such as Laura Burk, UnterNull, Zer1, Funky-T and Johnny Hollow. “His music spans and blurs the aural spectrum of idm genres, while experimenting with industrial and glitch-noise. His website’s bit-design also speaks to the inner g33k. I personally find his works creatively inspiring and mind-expanding.